My evening skin routine is where I spend the most amount of time and effort unlike my Morning Routine with is aimed at quickness. For someone like me who used to neglect their skin this is the favourite part of my skincare routine. There is something very satisfying about taking off all my make up and getting my skin squeaky clean. As soon as I get in a night the make up that has been sitting on my face all day suddenly becomes heavy and I can feel it,....I have to take it off straight away! Is it just me or do you feel the same? Cleansing.. I use two cleansers. The first is Bioderma Sebium H2O, I use this is remove the bulk of my make up and then go in with my Emma Hardie Cleansing balm. The balm removes every last trace of makeup including mascara. It feels luxurious and hydrating, cleaning away all the dirt without stripping my skin but in fact leaving feeling plump and hydrated. The second toner is La Roche Posay Seroznic, its zinc based and helps cleanse and soothe the skin before I put any of my serums and moisturisers on, the mist is fine and also very refreshing, so great as a pick me up. The lasts steps of my routine are to control, protect and hydrate. The first port of all is my eye cream, I've always applied my eye cream first as I can remember someone saying this is the best way to use them. Applying them after serums and moisturisers will create a fine barrier so its not as effective, whether this is true I don't know but I've been doing it this way for some time now. I use Origins A Perfect World for Eyes, this is a thick serum which is said to hydrate and prevent lines and dark circles from foaming around the eyes. It feels very hydrating but I cant tell if its really doing anything as I don't have any lines yet, so I suppose you could say it is working.....no? The serum I use is La Roche Posay Effuclar duo, I'm sure most of you are aware of this. The serum de-clogs and controls oils helping to maintain a spot free complexion. 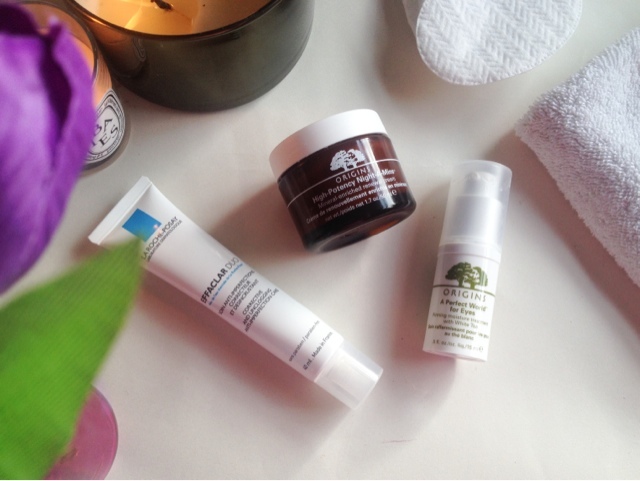 My night time moisturiser of choice is Origins High Potency Night-a-mins. This is so nice to use especially if you have combination skin like myself. The cream feels and looks rich and heavy but is in fact light and absorbs in the skin quickly, leaving it feeling so soft. I mean its unbelievable how smooth and silky my skin feels when I have this on! It doesn't break me out and my skin feels hydrated and slightly plumber in the morning, I definitely enjoy using this! 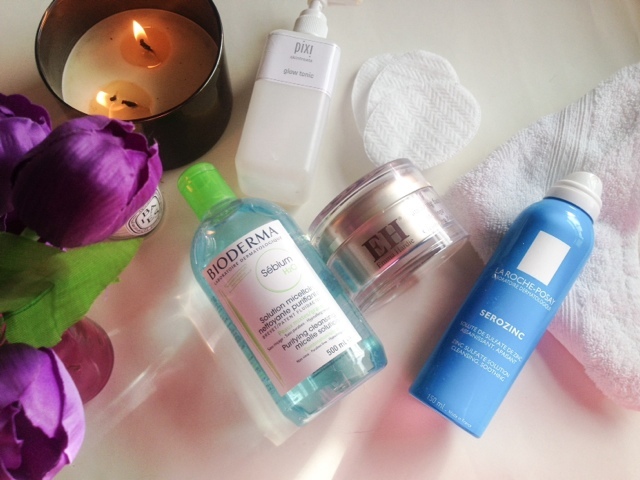 So there is my evening routine, do you use any of these products? What do you think of them? Amazing routine, I love every item! 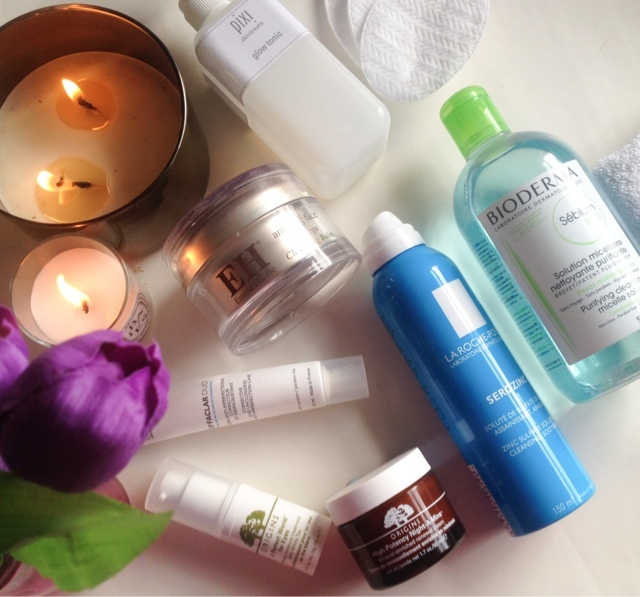 I especially love the Emma Hardie Moringa Cleansing Balm, it's really good on my skin. I'm yet to try the Pixi Glow tonic, but its been on my wish list for ages, I've got to get it soon. Thanks for sharing, this is a great blog.